The Zonkey is a hybrid animal that is created by cross-breeding two different species of animal that belong to the same genetic group. Technically though, an individual is only classed as a Zonkey if it is sired from a male Zebra and female Donkey, as one that has a male Donkey and female Zebra parents is known as a Zedonk. There are so many jokes in that previous paragraph I don’t even know where to begin. The fact that zonkeys do exist makes me very hopeful for the future. 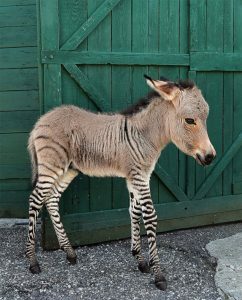 In fact, I think zonkeys are the future. Two perfectly fine creatures came together and created something even more perfectly fine. It’s gonna take a lot of that if we’re gonna survive. And if you ever feel as though you can’t survive, take heart. Tuesday May 1 is the birthday of Francesca Lia Block’s new book, The Thorn Necklace. An exploration of the writing life, this book offers visceral insights and healing exercises for the writer who creates as a way to process pain and adversity. Happy birthday, Thorn Necklace! I can’t wait to get my hands on a copy. Here’s more info on that.